Sir Augustine Danger "Austin" Powers, KBE, is a fictional character from the Austin Powers series of films. The character was created by Mike Myers. Mike Myers was also the actor who played the character in the films. He is the main character of Austin Powers: International Man of Mystery (1997), Austin Powers: The Spy Who Shagged Me (1999) and Austin Powers in Goldmember (2002). He is a British spy. He likes to go to parties and he represents the hippie culture of the 1960s. This is because he and his opponent Dr. Evil, were frozen during an experiment, and they stayed frozen for many years. The series' humor follows his attempts to adjust to the modern world as he continues to try to save it from terrorism. 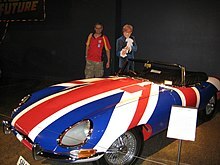 Austin Powers was a character seen as a parody of James Bond. The character was also influenced by Harry Palmer and characters played by Peter Sellers. The band Ming Tea was formed by Myers, Matthew Sweet and Susanna Hoffs during the 1990s. The band acted like a British band of the 1960s. The band members all performed under pseudonyms (fake names) with 1960s personas. Myers adopted the pseudonym and character of Austin Powers. This group made a number of live club and television performances in character. Myers' wife at the time, Robin Ruzan, encouraged him to write a film based on Austin Powers. Obituaries of Simon Dee (1935–2009), the radio and television presenter, claimed that the character of Austin Powers was inspired by Dee's "Sixties grooviness". Mike Myers has stated that the "Austin Powers" character was based on his own father. Video Games: Austin Powers, Austin Powers Pinball, Austin Powers: Welcome to my Underground Lair, Austin Powers: Oh Behave!, and Austin Powers: Operation Trivia. HBO purchased the rights to make a cartoon series based on the Austin Powers films in 1999. Despite announcing plans for a thirteen episode season, HBO never made the shows. Austin Powers has been used for advertising several products, such as Pepsi Cola. He also appears in the music videos for Madonna's "Beautiful Stranger", Beyoncé's "Work It Out" and Britney Spears' "Boys". In 2010, Austin Powers was voted #23 in Entertainment Weekly's list "The 100 greatest characters of the last 20 years." ↑ "THE MEDIA BUSINESS: ADVERTISING; Big marketers are betting on 'Austin Powers' to endear them to young people". The New York Times. 1999-06-14. Retrieved 2010-11-05. ↑ Montalbano, Dave (December 2010). The Adventures of Cinema Dave in the Florida Motion Picture World. Xlibris Corporation. p. 185. ISBN 978-1-4500-2396-2. Retrieved 5 August 2012. ↑ "Myers is funny, but he's no Peter Sellers". Deseret News (Salt Lake City) via HighBeam Research (subscription required). 28 November 2003. Retrieved 5 August 2012. ↑ Digital Hit (1997–2012). "Mike Myers". Digital Hit. Digital Hit Entertainment/ Multiplex Theatre Properties Inc. Retrieved 29 July 2012. ↑ "This Sort Of Thing Is His Bag, Baby". Newsweek. May 18, 1997. ↑ Evans, Peter (2009-08-31). "The groovy rise and sad fall of Simon Dee, the real Austin Powers". Daily Mail. London. Retrieved 2010-11-05. ↑ "TV chat show star Simon Dee dies". BBC. 2009-08-30. Retrieved 2010-11-05. ↑ "Dee day for the real Austin Powers". The Age. Melbourne. 2009-08-31. Retrieved 2010-11-05. ↑ "Austin Powers has The Force". BBC. 1999-06-14. Retrieved 2010-11-06. ↑ Kaplan, Don (1999-05-04). "YEAH, BABY! HBO SINKS TEETH INTO 'AUSTIN POWERS' CARTOON". The New York Post. Retrieved 2010-11-05. ↑ Seiler, Andy (1999-06-21). "The spy who won't go away HBO will animate 'Austin Powers,' and a third movie is expected". USA Today. Retrieved 2010-11-05. ↑ Ressner, Jeffrey (1999-06-21). "Cinema: Austin's Power". Time. Retrieved 2010-12-04. ↑ "Freebies Power Austin's Promotional Mojo". Orlando Sentinel. Retrieved 2010-11-05. ↑ "The 100 Greatest Characters of the Last 20 Years". Entertainment Weekly. Retrieved 2010-11-05.